We’ve teamed up with Mashable to show you a new side to healthy avocados. The critically acclaimed documentary is here. Follow the journey of the avocado from farm to table, and score a chance to win major prizes along way. We’ve teamed up with Tastemade to bring you recipe videos and tempting avocado creations from across America to help you explore the wonderful world of always in season avocados! The curiously complete fruit that goes with any meal. Check here weekly for new recipes – literally from soup to nuts. collection, there is something for everyone. Avocados don’t just taste great — they are great for you too! Learn the benefits of adding some avo to your day. Watch a few videos, and you can be the expert. Find tips on how to tell if an avocado is ripe, slice, and store your perfect avocado. Let us help you plan your breakfasts with our avocado breakfast meal plan. Get all that green goodness in and relieve some of the stress of your grocery trips! The avocado is a nutrient-dense food loved around the world for its mild flavor and creamy texture. With rough, deep green to bright green skin, pale yellow-green flesh, and a large, smooth seed, the avocado is a fruit unlike any other. On this page, you’ll find everything you’ve ever wanted to know about the beloved fruit that moonlights as a vegetable, the avocado. Although you’re probably most accustomed to eating avocados in savory dishes, they are, in fact, a fruit. Botanically, these versatile fruits are a type of berry with one large seed. The avocado fruit grows on the Persea Americana – also known as the avocado tree. This flowering tree is native to South Central Mexico and is a member of the plant family named Lauraceae. The tree now grows successfully in tropical climates across the globe. The avocado, which is also often referred to as the alligator pear, is an integral ingredient in many cuisines – from Mexican to Japanese and almost everywhere in between. Popular ways to showcase the avocado’s mild and creamy flesh include the delicious Mexican dip guacamole, salads, sushi, on toast, and in chilled milkshake-style drinks that are common throughout South East Asia. The avocado is a medium-sized fruit with bright green to green-black and even purple bumpy skin, and soft, pale green flesh. In the center of the fruit is a large, smooth, brown seed. Avocados come in a variety of shapes and sizes: there are big ones, little ones, pear-shaped ones, egg-shaped ones, and even spherical ones. The skin of the avocado is unlike that of other fruits and vegetables. Most varieties of avocados have a bumpy, pebble textured skin with a glossy, almost leather-like finish. The color of the skin ranges from bright green to an almost black-purple hue. An unripe avocado is a bright yellow-green color. Depending on the variety, a ripe avocado is usually a deep green color. An overripe avocado is a very deep green, almost black-purple color. As well as firmness, the color of an avocado is a good indicator of ripeness. If you’re curious, check out how you can slow the ripening of avocados. Like some other fruits, such as bananas, the skin of an avocado is not generally eaten. That being said, don’t throw away avocado skin without first scraping off the dark green flesh from the inside. The part of the fruit directly underneath the skin contains the highest concentration of antioxidants found in the avocado, including phytosterols such as beta-sitosterol. Avocados contain 38 milligrams of beta-sitosterol per 50 g serving. Beta-sitosterol is one of the three predominant phytosterols found in plants. These compounds may help maintain healthy cholesterol levels. Phytosterols are plant sterols naturally found in plants that are molecularly similar to animal cholesterol. In the intestine, research has shown they can act to lower the absorption of cholesterol. According to the FDA, 2 grams of phytosterols per day may help maintain healthy cholesterol levels. According to the FDA, 2 grams of phytosterols per day may help maintain healthy cholesterol levels. Some at-home beauty enthusiasts even claim that rubbing the inside of an avocado peel over your face makes for a wonderful, nourishing face mask! There’s no denying – avocados are absolutely delicious. The pale green to yellow-green fruit has a distinctive creamy, oily, and balmy texture that cuts easily, and can be spread or mushed into a dip-like consistency. Avocados have a mild taste, with a hint of sweetness. If you have never tried an avocado before, imagine the taste of a fresh, rich, velvety butter substitute produced by trees. In the center of all, avocados have a large, golf-ball sized seed that makes up roughly 10 to 25% of the fruit’s total weight. The seed is spherical in shape, chestnut to dark brown in color, and has a smooth, shiny texture. Unlike other berries, the avocado has just one seed. Like the skin, avocado seeds are not usually eaten. Some avocado enthusiasts crush the seed into a coarse powder and brew it into a bitter tea. Others run the seed through a juicer or add it to smoothies (however a warning is necessary to take proper precautions before you try that at home). Although the seed does contain nutrients, it is not necessary to eat it to get the full health benefits of avocados. Make a natural, pink-colored dye. Dry the seed, grind it up, and use it in a DIY facemask. The finely ground seed particles work wonders as a natural exfoliator. Keep your guacamole looking fresh. Some claim that if you add the whole seed to your guacamole, it won’t turn brown. One of the most popular ways to make the most of your avocado seed is to sprout it and grow your own avocado tree. This is a fun and easy process anyone can try – even if you lack the illusive green thumb. 1. Remove your avocado seed and clean off any excess fruit. If you’re having trouble cleaning the seed, try soaking it in some water for a couple of minutes before scrubbing any remaining flesh off. Be careful not to remove the thin, brown skin. This is the seed cover. 2. Determine which end of the seed is the top, and which is the bottom. Although the seed is ball-shaped, one end will be a little pointy, and the other will be a little flat. The flattest side is the bottom where the taproots will emerge, so it will need to touch the water. 3. Take four toothpicks and insert them around the circumference of the avocado seed. These will act as a type of scaffolding, allowing the bottom of the seed to rest in the water, while the top stays dry. 4. Position the avocado seed over a glass or jar of water, so the bottom half of the seed is submerged. Opt for a clear glass if possible, so you can watch as the seed sprouts into the water. 5. Now you can sit back and wait for your seed to sprout. Over time, the top of the seed will dry out and form a crack. Then, as the crack moved to the bottom of the seed, the seed cover will come off. From the crack, a small taproot will emerge. The taproot will continue to grow down and may branch. Eventually, a sprout will grow out of the top. This process can take anywhere from 4 to 6 weeks. 6. When your sprout is about 6 inches tall, you can plant it in your garden or in a pot. Avocados are nutritional powerhouses – that’s why so many people refer to them as super-foods! Incorporating avocados into your regular diet can have astounding benefits to your health and wellbeing. For example, avocados are virtually the only healthy fruit with good fats and are a delicious way to help people meet the Nutrition and Your Health: Dietary Guidelines for Americans’ recommendations to shift from eating saturated fat to good fats.Amazingly, avocados contain nearly twenty vitamins and minerals. 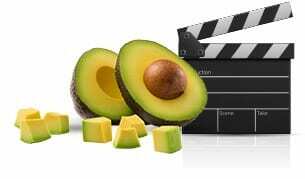 Avocados are a good source of Pantothenic acid, a B-vitamin that helps the body convert food to energy. Avocados provide 14% of the DV per 50 g serving. They’re also considered a good source for nutrients like vitamin K and fiber. Vitamin K, a nutrient that the body needs to stay healthy is important for blood clotting and healthy bones and also has other functions in the body. One 50 g serving of avocado provides 10% of the DV for Vitamin K. What’s more, diets rich in healthy foods containing fiber, such as some vegetables and fruits, may reduce the risk of heart disease, obesity, and type 2 diabetes. Healthy avocados are a good source of fiber (3 g per 50 g serving) and are a great fresh fruit option to help boost fiber intake. Finally, one serving (1/3 of a medium avocado) contains small amounts of vitamin A (4 mg), magnesium (0.1 mg), vitamin C (4 mg), vitamin E (1 mg), iron (0.3 mg), manganese (0.1 mg), zinc (0.3%), potassium (254 mg) and phosphorous (27 mg). As well as these vitamins and minerals, avocados are known for their “good” fats. In the recommended 1/3 of a medium avocado serving (50g), About 75 per cent of an avocado’s fat content comes from mono and polyunsaturated fat – that’s 6 grams per 50 gram (approximately one third of an avocado) serving. Dietary fats are a type of nutrient that can help with the absorption of fat-soluble nutrients, including vitamins E, K, D, and A. The Nutrition and Your Health: Dietary Guidelines for Americans emphasize making small dietary shifts to achieve an overall healthy eating pattern, such as replacing foods higher in saturated fats with healthy foods containing good fats, like avocados. Still not convinced that the avocado is a powerful super-food? Here are 9 proven benefits of eating avocados. What makes avocados even more nutritionally spectacular is their good fats, and zero cholesterol and sodium. Did you know healthy avocados contain 5g of monounsaturated fat and 1 g of polyunsaturated fat per 50 g serving (one-third of a medium avocado)? Over 75% of the fat in an avocado is unsaturated, making it a great substitute for foods high in saturated fats. Per the Dietary Guidelines for Americans, replacing saturated fats or trans fats with unsaturated fats can reduce bad cholesterol levels in the blood. Per the Nutrition and Your Health: Dietary Guidelines for Americans, while many adults consume sufficient amounts of nutrients, there are nutrients like potassium, that are consumed in amounts below the Estimated Average Requirements. Potassium plays a number important roles in the functioning of a healthy body, including the maintenance of electrical gradients in the body’s cells. Other food sources of potassium include white potatoes, beet greens, white beans, plain yogurt, and sweet potato, too. You’ve probably heard that bananas are a great source of potassium. One medium avocado contains 6%, 254 mg, of the recommended daily dietary allowance of potassium. One medium (7-7 7/8″) banana contain 12%, 422 mg, of potassium. Fiber plays an important role in a balanced diet, particularly in relation to digestion. 1/3 of a medium avocado offers 3 grams of fiber. This is approximately 11% of your recommended daily value of fiber. Some vitamins and nutrients are fat-soluble, meaning your body requires a fat source to properly absorb them. Vitamins A, K, D, and E, as well as antioxidants such as carotenoids, use fat to move from the digestive track into the rest of the body. Because avocados contribute good fats to the diet, eating avocado not only offers additional nutrients, but also helps improves the nutritional value your body gets from other foods. Avocados contain many antioxidants, including of the carotenoids zeaxanthin and lutein, which research suggests both may help maintain eye health as we age. Each serving (1/3 of a medium avocado) contains 136 mcg per 50g serving. The dietary fiber found in avocados (11% DV per serving) can help you feel more satisfied after you eat. This is because bulk added by the dietary fiber can help you feel fuller faster. This may prevent snacking between meals and can assist with weight maintenance. The next time you think about reaching for that afternoon sweet fix, grab an avocado instead. Avocados are a healthy food that can be incorporated into a ton of different dishes, from salads and sandwiches, to sushi and dips. No matter what your personal tastes are, you can find a way to enjoy avocado on a regular basis. The truth is, some healthy foods just don’t taste good to most people. Certain vegetables can lack flavor or taste bitter. Avocados, on the other hand, have a mild flavor that tastes delicious on its own or paired with other foods. When it comes to being a healthy fruit and tasting great, avocados really do have it all! The avocado fruit grows on a large, subtropical tree known as Persea Americana. This species grows up to 66 feet high and features medium (between 4.7 and 9.8 inches long), sturdy, deep green leaves, and small, greenish-yellow flowers. The avocado tree grows out into a wide, bushy plant with a light brown trunk. Persea Americana is a subtropical plant species that requires a warm, humid climate with minimal wind. The avocado tree is not naturally tolerant of frost. When even mild frost occurs, the tree tends to prematurely drop its fruit. Some species, including Hass, can survive temperatures of 30 degrees Fahrenheit and less. In addition to this subtropical climate, the avocado grows best in deep (preferably over 3 feet) of thoroughly aerated soil. Growing conditions for the avocado tree are ideal in many countries and regions across the globe, including Mexico, Colombia, Chile, Central America, Peru, the Caribbean, Venezuela, Ecuador, Puerto Rico, California, Arizona, Hawaii, Florida, Texas, Australia, New Zealand, Spain, Portugal, Crete, Morocco, Indonesia, Vietnam, Sri Lanka, Rwanda, and areas of Southern India. If you live in a subtropical climate, you may like to grow your own avocado tree. You can do this by purchasing a seedling or small tree, or by sprouting an avocado seed as we outlined above. There are many cultivars of avocados used for both at-home and commercial growing. Here are a few of the most common types. You’ve probably heard of Hass avocados before. Hass is the most common cultivar – in fact, 80% of the world’s avocados are Hass. Hass avocados are popular due to their nutty taste, year-round availability, and long shelf life. Hass avocados have a distinctly pebbled skin that changes color from bright green to deep green and even black-purple as the avocado ripens. They have a rich flavor, creamy rather than watery texture, and feature a 19% oil constitution. All Hass avocados are descendants of one “mother tree” that was grown by a man named Rudolph Hass in La Habra Heights, California. The species was patented in 1935, and the “mother tree” survived an impressive 67 years after that before it was cut down in 2002 after dying of root rot. Alligator pear: if you had never seen an avocado before, you might have come up with this name yourself! The pear-shaped fruit and rough, alligator-skin textured peel have earned the avocado this quirky nickname, which is used widely in Central and South America. Butter fruit/butter pear: avocados are loved for their rich and creamy texture, which may be described as buttery. That’s why the avocado is sometimes called butter fruit or butter pear! Midshipman’s butter: amazingly, the avocado was a rarity in Great Britain for three centuries after it was first discovered. Many people had never seen an avocado before, but heard about the fruit in reports sent back by colonial servants who were overseas. This lead to the nickname Midshipman’s butter. The demand for avocados is increasing worldwide, with many countries importing millions and millions of delicious avocados each and every year. When it comes to production, nowhere comes close to the avocado’s place of origin, Mexico. Mexico is followed by Chile, Indonesia, Columbia, and the Dominican Republic. The people of LA sure do love their avocados! While avocados are delicious on their own, or prepared simply with salt, pepper and lemon juice, there are many iconic avocado dishes that everyone should try. First and foremost, there’s guacamole. This tasty avocado-based dip is a Mexican favorite. It is enjoyed at parties, on game day, and at Mexican fiestas! Most families have their own unique recipe but the most common ingredients are creamy Hass avocados, tomatoes, onion, cilantro, chili, lime juice, salt, and pepper. Serve with corn chips or crisp tortilla bread. Delicious! In Indonesia, avocado is commonly used in a sweet milk shake like drink. The velvety flesh adds an additional layer of creaminess to this tasty treat. In Australia, avocado is commonly eaten on toast with lemon, salt, and pepper. Sometimes they add Vegemite to the bread or place a soft poached egg on top. Because the avocado is a source of oil and good fats, and has a smooth, spreadable texture, it’s a fantastic butter substitute for those who want to try something new or are looking for an alternative. Use avocado as you would use non-melted butter, such as on toast and sandwiches. You can even substitute 1 cup of pureed avocado for 1 cup of butter in some baked goods. Just note that this may yield a slightly different taste and texture. 1/3 of a medium avocado (50g) 2 Tbsp. 2 Tbsp. 2 Tbsp. 2 Tbsp. 2 Tbsp. * nutrition data given for butter, unsalted; Shortening, household, soybean (hydrogenated) and palm; margarine, regular, 80% fat, composite, stick, with salt; cheese, cream; and oil, canola. The avocado is a great addition to your diet. But, did you know that people use the avocado for more than just eating? The avocado contributes nearly 20 vitamins and minerals to your diet. Paired with a high oil content, this miraculous fruit is championed as a diy beauty product. Simply mash the avocado and spread over your face (avoid the eye area), or distribute into your hair. Let it sit for about 20 minutes before washing away. The result: soft, supple, hydrated skin and hair. The avocado seed has a use beyond food as well. After the seed has been cleaned and dried, it can be whittled into small shapes. Add a coat of varnish and you can keep your carving for years to come. There are so many ways to enjoy the avocado in your diet. You may want to check out our Recipe Hub for tips and inspiration on preparing avocados. Our Mexican omelet is the perfect way to start the day. Or, if you’re looking for something a little more decadent, try the seriously delicious desserts. Got a party coming up? Whip up some delicious guacamole. Or maybe you’re looking for a quick and easy weeknight dinner; please the whole family with our avocado mac and cheese.